Note: While this article and UltimatePluginTool are specifically for VST plugins on Windows operating systems, some of the information here may apply to other plugin formats and platforms. Before we get started with UltimatePluginTool, it will help to make sure that all of your Native Instruments products are activated and up-to-date. Launch the Native Instruments Service Center and make sure you see the "All products are activated" message on the Activate tab. If you don't, go to the Update tab and download/install any pending updates. Note: It is still possible to get errors about Reaktor and Kontakt instruments being saved with newer versions of those products even after you've installed all your updates. UltimatePluginTool will help you fix those errors if you perform the following steps. You should just be sure you've installed the updates before you proceed. You should also make sure to quit any DAWs, plugin hosts, or Native Instruments software before you continue. If you have multiple copies of different versions of plugins scattered about your various plugin search paths, DAWs and plugin hosts can get confused, loading an outdated version of the plugin even after you've installed updates. 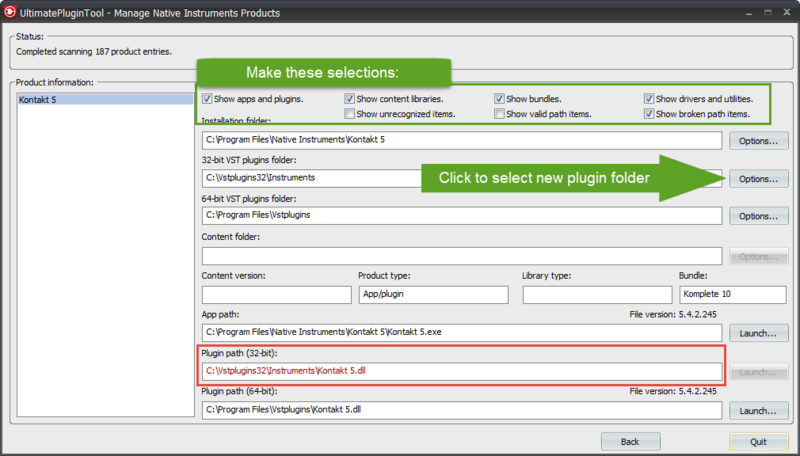 On the UltimatePluginTool Start page, select Find duplicate VST plugins and click Next. If you are running 64-bit Windows, you'll have a choice of whether to search for 32-bit or 64-bit plugins, since those files are normally installed in different locations. Choose which plugin type you'd like to check for first, and then make sure your desired plugin paths are listed under Plugin folders. The first time you run this wizard, UltimatePluginTool tries to detect some common plugin locations on your system. If you use different folders than those that UltimatePluginTool finds, you can make the appropriate changes now with the Add New and Remove buttons. The program maintains different folder lists for 32-bit and 64-bit plugins. The program discovered some plugin folders on this computer. If you keep folders in other locations, use Add New to locate and include them in the search. Click Next. UltimatePluginTool will search your plugin folders for any duplicate files, or for unsupported files (for example, 64-bit plugins in your 32-bit plugins folder). Once the scan is complete, some statistics will appear in the Search status portion of the screen, and if any duplicates or unsupported files are found, their names will appear in the Duplicate files and Unexpected files lists below. The results of a scan for 32-bit duplicates. Since 'show duplicates' is unchecked, only files with duplicates are displayed at the moment. Select a filename in the Duplicate files list to see more information about the specific files discovered. In the above example we can tell that the first file in the details list is the older one by its Date and Version number. Selecting a file in the details list enables the three action buttons on the right. To remove the outdated file, click Delete, then click Yes when asked whether you would like to proceed. Remember to re-run this wizard if you are running 64-bit Windows, in case you still need to scan for 32-bit or 64-bit plugins. 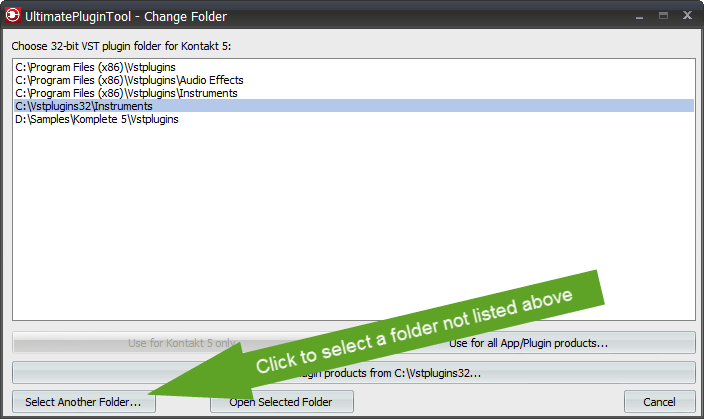 See the included user guide for more information about the Find Duplicate VST Plugins wizard. Once you're sure there aren't any duplicate copies of your 32-bit or 64-bit plugins in your various plugin folders, re-launch UltimatePluginTool or navigate back to the Start page. 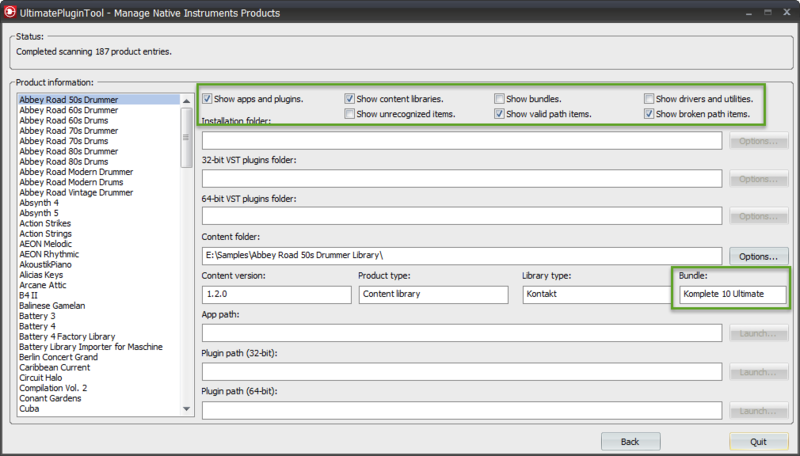 Select Manage installed Native Instruments products, and then click Next. Note: If you have a large number of Native Instruments products installed, or if you have some very old 32-bit-only products installed, the product scan might take a minute or two the first time you run it. Once the scan is complete, it will populate the "Product information" list with all products discovered on your system. The above settings will display only products with detected file path problems. 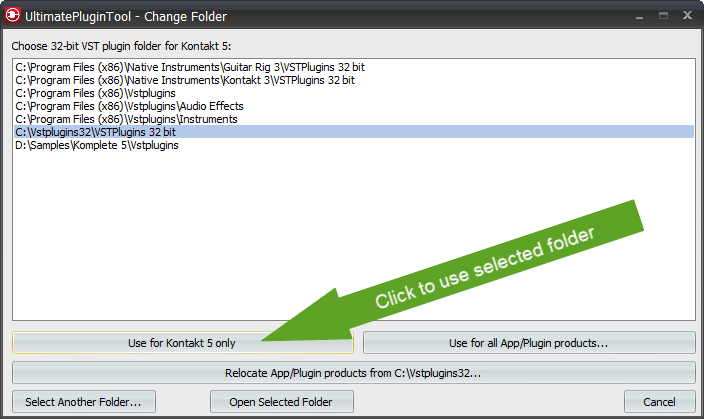 In the above example, UltimatePluginTool discovered that it couldn't find the Kontakt 5 plugin in the folder where it's supposed to reside. This happened because we just used the duplicates finder to delete the outdated version of the plugin that had been located in that folder. 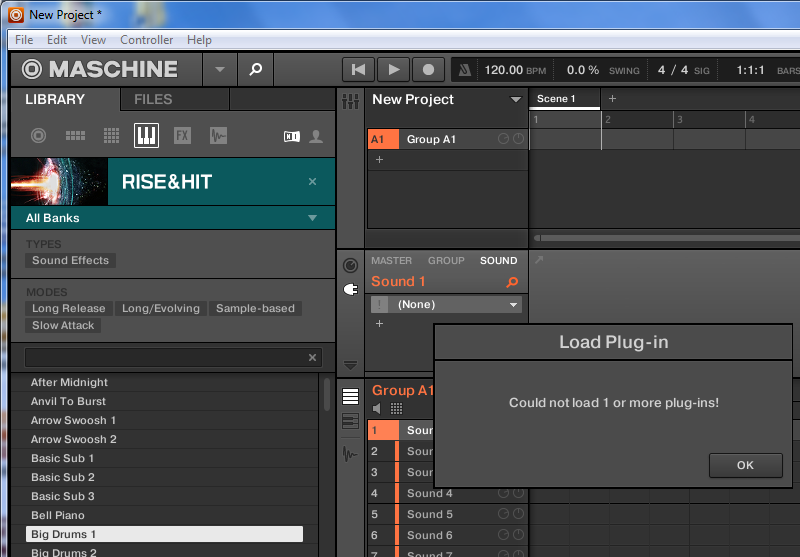 Even though we know there is a recent version of Kontakt 5 in our plugin search paths, if the plugin isn't located in the exact folder specified on this screen, then Komplete Kontrol and Maschine won't be able to find the plugin if you try to load any Kontakt instruments with them. 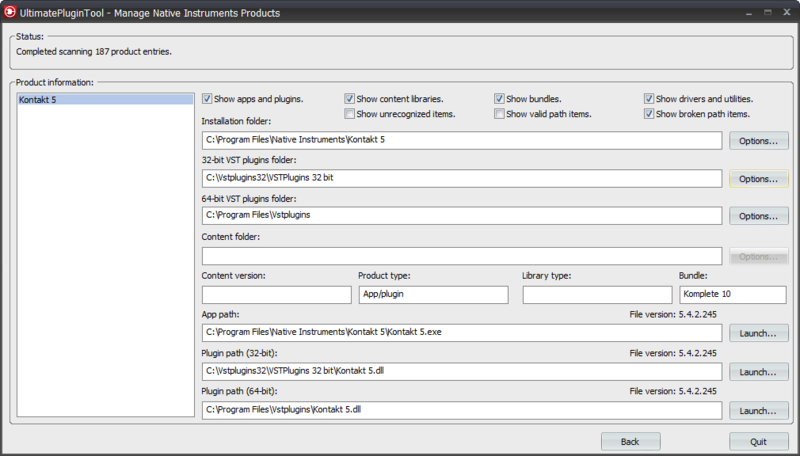 This dialog lists all the folders that all currently installed Native Instruments products (including the current one) are already using. If you see the folder you want already listed, just select it and then click the Use for (product) only button. In our case, the folder we need isn't listed, so we need to click Select Another Folder and locate the folder. Once the folder's selected, we can click Use for (product) only to continue. After you select a different folder, UltimatePluginTool re-checks the paths. As we can see here, we selected the correct path, and we have the latest versions specified for the application, 32-bit plugin, and 64-bit plugin files. The Komplete Kontrol software is explicitly designed to only work with Komplete 9 or Komplete 10, and this requirement has some side-effects that surprise some Komplete 9 and 10 owners. Consider this example: Reaktor 5 is available as a standalone product, and has also been in every Komplete release since 2005- however if you didn't use a Komplete 9 or 10 installer to install or update Reaktor 5 on your PC, Komplete Kontrol will not work with your existing copy. Unfortunately, it is now necessary to perform a complete installation of Komplete 9 or 10 in order to make sure all your applications and libraries are recognized by Komplete Kontrol as belonging to the supported bundles. This is because the Komplete installers are special. Even though the Reaktor 5 you bought in 2005 is technically exactly the same program as the version included in Komplete 10 (assuming you've kept up with your Service Center updates), the Komplete 10 installer associates any product it installs or upgrades with that specific bundle. All Komplete installers do this, but it wasn't until the release of Komplete Kontrol that this fact actually mattered. Anyway, here's how you can use UltimatePluginTool to determine if this is what's happening on your computer. On the Start page, select Manage installed Native Instruments products, and then click Next. Beginning with Komplete 8, there is some overlap between the "Ultimate" bundles and the regular Komplete releases. For example, as shown in the screenshot above, Abbey Road 50s Drummer is only available in Komplete 10 Ultimate, so that's what appears in the Bundle field in UltimatePluginTool. However, if we had selected Battery 4- which is included in both Komplete 10 and Komplete 10 Ultimate, then the Bundle field would just read "Komplete 10" even though this computer has the full Komplete 10 Ultimate package installed. This shouldn't be an issue, though- it's the version number that matters to Komplete Kontrol. If you have Komplete 9 or 10 (regular or Ultimate) installed, and a product you select on this screen is blank or is associated with an earlier version of Komplete, then you'll need to re-run the Komplete 9 or 10 installer to update your installation and associate it with your bundle in order to get it working properly in Komplete Kontrol. I have some features in the works that should make solving these problems even simpler, so stay tuned. This should at least be enough to help you root-cause the various issues you're having and know what to do to fix them.